Four victims of a horrific shooting will finally be laid to rest as their bodies are transported to Israel for funeral services and burial. The victims, a rabbi, his two sons and an 8-year-old girl were wrapped in prayer shawls and laid on a podium in front of hundreds of mourners that included the French foreign minister. The lives of these innocent four were maliciously taken as they were gunned down at a Jewish school by a gunman who fled the scene on a motorcycle. The suspect was later identified as Mohammed Merah, who continues to remain at a standoff in his apartment with police and negotiators. According to officials, Merah is a self-described jihadist with ties to al-Qaeda, and his shooting rampage was spurred by the massacre of Palestinian children at the hands of U.S. and NATO troops. Merah is believed to be a lone wolf, and at this time, there is no reason to believe there are additional suspects involved. Rabbi Jonathan Sandler was a school teacher who pursued religious studies in Israel before returning to France for a teaching position. His sons were Arieh, 5, and Gabriel, 4. The fourth victim was 8-year-old Miriam Monsonego, the daughter of the school’s principal. Her father was present at the time of the shooting and witnessed his daughter being gunned down. Such a senseless act of brutality and loss of innocent life serves as a reminder that violence of any form must be strongly condemned. It is a time for unity and to set aside petty differences. It is also a time to recognize that evil exists and that steps must be taken to maintain the security of a sovereign nation. With grieving losses come strength and a call for people to unite and put an end to hate from all sides. UPDATE: Mohammed Merah, the man believed to be the gunman on a scooter who killed seven people in south-western France, is a 23-year-old French citizen of Algerian extraction. 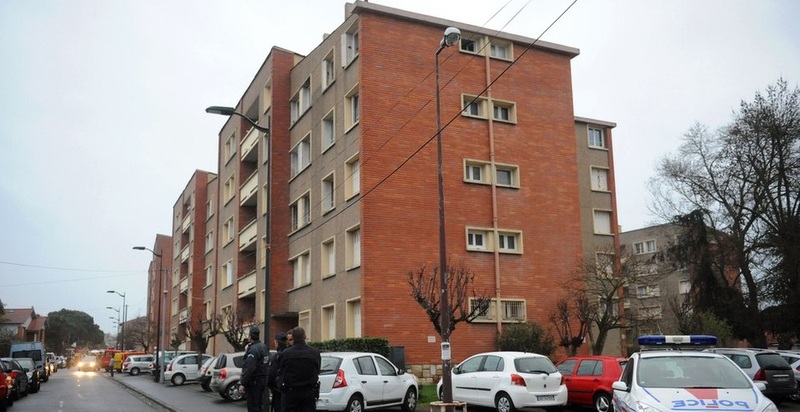 Police in France surround a block of flats in Toulouse where they say the suspect in Monday’s shooting of a rabbi and three children at a Jewish school is holed up. The man informed police he wanted to “avenge Palestinian children” and denounced French “crimes” in Afghanistan. The attack occurred earlier this week at a Jewish school in Toulouse, France. According to witnesses, a lone gunman entered the building and shot a teacher and three children dead in the school, also injuring one more teenager. The attacker then fled on a scooter, in a similar fashion as from two earlier incidents in France last week. The same type of caliber was also used in all 3 attacks, a .45 calibre gun, and the search for the killer is under way. This marks a very deadly series of incidents to happen in the country in a very short time frame. According to sources close to the investigation, CCTV cameras captured the license plate number of the scooter, and the police is searching for this vehicle along with its owner. Meanwhile, a special memorial is being setup for the victims and will be taking place in one of the synagogues in Toulouse. President Sarkozy flew to the city and declared the attack a national tragedy, after speaking with some of the friends and families of the victims. He asked all students in France to observe a minute of silence on Tuesday, and said the hunt for the killer was well under way. All other candidates in the France election campaign have suspended their activities for the week. The attack Monday occurred at around 8 am, just as school children arrived with their parents. According to witnesses, the gunman apparently pulled up on the black scooter and began shooting at an area where primary-age children would be dropped off by their parents. According to witness accounts, he shot at everybody in the area, including kids and adults. The students fled into the school as the gunshots were heard. Some say he used a 9mm gun, but then the weapon jammed and he switched to a .45 calibre weapon. Over 60 officers, including some anti-terrorist specialists, were brought on the scene earlier in the week to investigate the other shootings, and were quickly on the scene, but could not arrive in time to stop the suspect. Several helicopters scanned the area for most of the day, while France Prime Minister Fillon said extra security would be put in place at all schools and religious buildings. This is the third attack in a short time in the southern part of France. On March 11, an off-duty airborne trooper was shot dead in Toulouse, on March 15 two soldiers were killed and one more injured while waiting at a cash machine in Montauban, and on March 19 three children and a teacher were shot dead at the Toulouse school. While there’s no definitive evidence that all 3 attacks were conducted by the same person, that’s what it seems so far. This latest attack was the deadliest attack on Jews in France since a 1982 shooting.